This page shows universal steps how to add a link to SiteBar in any browser. There are more comfortable ways of adding bookmarks which are specific to a particular browser. See, e.g., adding link to SiteBar using Firefox or adding link to SiteBar using Internet Explorer. You have to be logged in to SiteBar to access and manage bookmarks online. 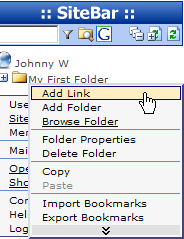 Right click on a folder or a tree where you want to create a new link. A context menu will be displayed. Select context menu item Add Link. An Add Link dialog shown below will be displayed. Parent Folder - this field is read only, you can verify where your new link will be created. Retrieve Link Information - a button which retrieves Link Name, Description and Favicon for the URL entered in the URL field. 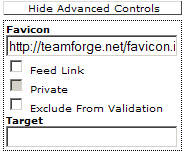 Favicon - a favicon is displayed (when available). Import Description - press this button if you want to import a link description from a file. Press button [Submit]. You can also click on Show Advanced Controls to extend the dialog as shown on the picture below. Feed Link - links that are marked as feeds will be opened using an external Feed Reader. Feed Reader URL is configurable in User Settings. Exclude from Validation - if you are adding a password protected or an Intranet link, then you should tick this on. Validator will then skip such links and will not mark them as dead. Target - a target where the page should be opened, you may use _blank, if you want this particular link to be opened in a new window. Usually you keep this field empty.